Seven years since her last EP and fourteen years since her last LP, Michelle Branch has returned from the long hiatus to bring Hopeless Romantic, an album of love and heartbreak. It’s a largely unsurprising route to take, as her previous albums revolve around similar themes. However, this time she brings life experience and a brand-new sound that is more electronic-based instead of her usual pop rock signature. Her previous album, Hotel Paper, was a guilty pleasure of mine, as I had a fondness for the period of pop rock that also spawned Avril Lavigne and Kelly Clarkson. Times have moved on, however, and so has Branch. So was the change in sound an improvement and a great evolution to her original work? In short: a little bit. Branch’s previous work struggled to be interesting production-wise. 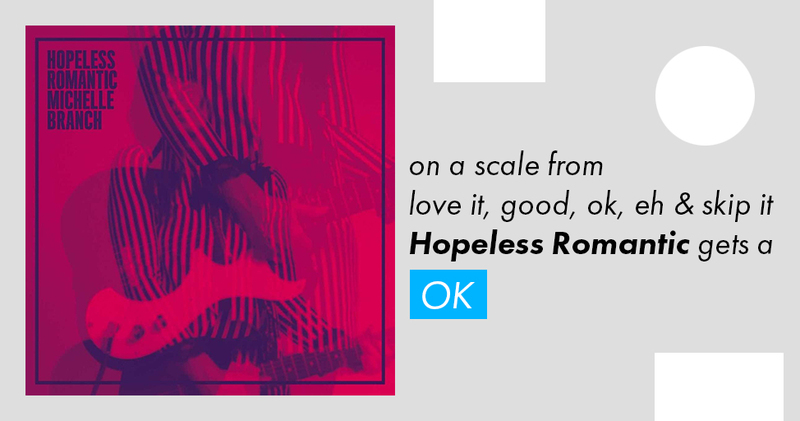 But with production help from Patrick Carney of The Black Keys, Hopeless Romantic took a drastic turn. However, every chance the album gets to do something really cool, the lyrics and overall structure bring it down. “Best You Ever” brings out a new Michelle Branch who springs into action with an 80s groove that could easily have been sung by Gwen Stefani, which she sounds a lot like at times. “Best You Ever” is the album at its best. It’s not absolutely stellar, or even all that memorable as much as Branch pleads for us to remember her; but in the moment, it’s catchy and fun. “You’re Good” best defines a lot of the frustrations that are in the album. The production is great, with bouncy synthesizers shaping a more defined personality, but Branch herself doesn’t offer very much to it. She’s not a bad singer, but there isn’t much energy or strength in her delivery. On top of that, the lyrics are only okay. There’s only so much excitement that can alone come out of “Everybody tells me that you’re not enough / They don’t understand you like I do.” The combination of drab lyrics and a wanting performance leaves the song heavily flawed. “Living A Lie” is a highlight, primarily by hitting an equilibrium between Branch’s singing and the heavily guitar-focused performance around her. It’s gritty, yet still very poppy. This continues on with “Temporary Feeling.” The album becomes incredibly satisfying when the album focuses on having fun, because that is when Michelle Branch shines. She comes off as enthusiastic, mirroring the sounds of Carly Ray Jepsen. Hopeless Romantic is supremely average…most of the time. That’s what makes this album so frustrating; there is not a single thing that could be described as a deal breaker, but there are so many missing pieces that doesn’t let the album reach the levels that it aspires to achieve. It’s such a shame because there are good songs that are really enjoyable when everything comes together. There are a lot of moments where Branch flows well with the music and the lyrics help accentuate the tone. However, there are other times when that moment of joy only happens in a handful of seconds. Songs are weak when Branch leans on the lyrics. The rest is very listenable and can be appreciated by longtime Michelle Branch fans and even some The Black Keys followers looking to listen to a production that references Carney and Auerbach’s music. For me, come for the stellar music and accept an experience that isn’t consistently pleasant. OK.